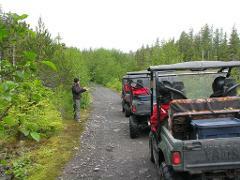 Explore the Tongass National Forest side by side with your companion. Enjoy beautiful scenery as you search for wildlife such as Alaska Coastal Brown Bears, Sitka Blacktail Deer and American Bald Eagle. Ride OHV's and hunt for Alaska Coastal Brown Bears on Kruzof Island and enjoy fly fishing for Dolly Varden Char and Salmon on one of the most productive rivers near Sitka. This all inclusive 8 Hour excursion is one you are sure to enjoy. 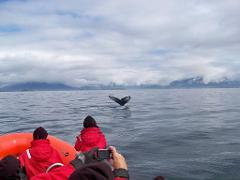 You will explore some of the most spectacular places in the Sitka area on this fast and fun excursion. Travel on Ocean Rafts and OHV's to beautiful and rarely seen places in search of, Whales, Sea Otters, Puffins, Bears, Deer, and more. 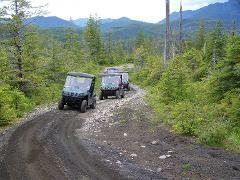 Explore a volcanic island with OHV's and afoot on this adventurous 6 hour excursion. Enjoy scenic views while hiking around the top of a volcanic crater. Then you will drive OHV's to an ocean beach where you will enjoy a picnic. 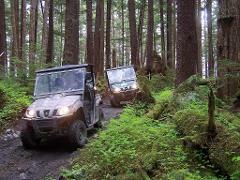 Explore the Tongass National Forest riding Yamaha Rhino OHV's. Explore beautiful forest and meadow areas and view wildlife such as Alaska Coastal Brown Bears, Sitka Blacktail Deer and American Bald Eagle. Picnic on a secluded ocean beach. 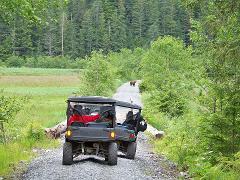 Ride OHV's and search for Alaska Coastal Brown Bears on Kruzof Island and then go saltwater fishing for Salmon, and Rockfish. 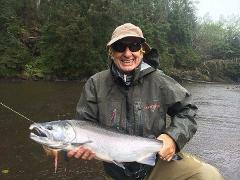 This 8 hour full day excursion includes food, gear, bait and tackle but not a sport fishing license.